With the optional Brush Guard attached, the Ruffwear Web Master harness offers better comfort, more support, and greater Stability. Watch this short demo video to see how easy it is to attach the Brush Guard in Seconds! Need help sizing your harness? Don’t miss this demonstration and tutorial video about how to lengthen Ruffwear harness straps. 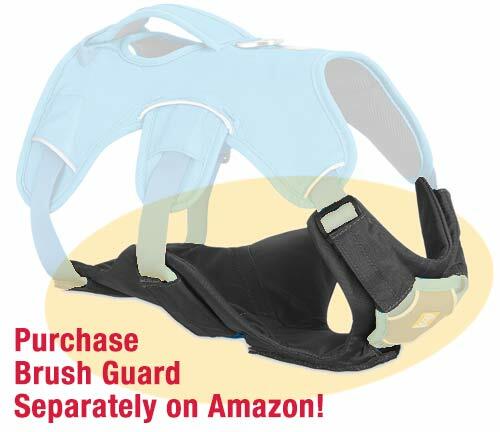 The Brush Guard is included with every Web Master Plus harness sold in the Tripawds Gear Shop. Add the Core Cooler for additional comfort in warm weather. Read full review for complete details. Thank you for making that so easy to follow! I am going to put Mitchell’s on his and see if that stops the rubbing on his chest. So happy to hear that Jackie. Let us know if we can help in any way. It shouldn’t cause irritation.